Kitchen Cabinets and Granite Countertops, Pompano Beach FL > Blog > Blog > How Is Granite Formed & How Long Does It Take? Granite slowly forms deep underground as a result of volcanic eruptions. Long before granite lines your countertops it endures a great deal of heat and pressure for as long as millions of years. As a result of these conditions, granite is incredibly strong and long lasting, as well as resistant to cracks and deterioration. Pretty much nothing that happens in your kitchen can compare to the harsh environments granite deals with while forming underground. Granite can be found buried deep underground on almost every continent. It is removed in large slabs from deep in the earth. These slabs are transported to factories where they are cut, polished and sent out for commercial usage. Granite is most commonly found in shades of brown, green and black, but it’s also available in pink, white or gray. It is often a combination of all of these colors, with a few colors standing more prominent than others. As far as we know, granite can only be found on our planet and it is considered the signature rock of Earth. Other rocky planets like Mars and Venus are covered with basalt, the same rock found in the ocean floors of Earth. Large slabs of granite are found in areas where Earth’s crust is deeply eroded. Granite must slowly cool in deep locations in order to produce the large grains you see throughout. The formation of granite is sparked by lava eruptions, but the lava must contain the same composition as granite (rhyolite), which is only found on land and is not produced by oceanic volcanoes. Granite forms when the continental rocks melt, a process that occurs from high heat and the addition of volatiles (water and/or carbon dioxide). Continents are hot because they are where the majority of our Planet’s uranium and potassium exist; they heat up their surroundings through radioactive decay. If the crust is thickened, it tends to get hotter inside, such as in the Tibetan Plateau. Plate tectonics, typically subduction, force basaltic magmas to rise beneath the continents. Add heat to this process and magmas release CO2 and water that help melt rocks. As the basalt releases heat and fluids, large chunks of continental curst have the potential to transform into granite. It’s largely believed that large slabs of granite form as a result of the continents stretching apart during plate tectonics. This would allow granite to form without melting, pushing or exploding upwards towards the surface. What Sets Granite Apart From Other Rocks? There are several types of granite, including I-type (igneous) S-type (sedimentary), M-type (mantle) and A-type (anorogenic). The differences between these types of granites are very subtle and long debated. There are other rocks that are somewhat similar to granite, such as gneiss, but nothing is quite like granite. There are three things that distinguish granite from other rock forms. #1. Granite is made up of large mineral grains. That’s where it gets its name; granite is Latin for tightly fit together “granum” or “grain.” The individual grains speckled throughout granite are large enough for the human eye to detect, which really adds to its beauty. #2. Granite always contains the same minerals: quartz and feldspar, along with a variety of different “accessory” minerals. 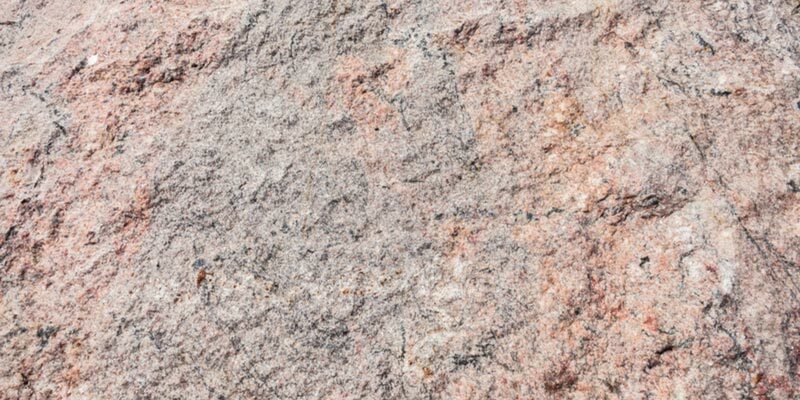 The quartz and feldspar are responsible for giving granite a lighter hue—hence the abundance of white and pink shades found throughout granite. Darker accessory minerals highlight granite’s light background coloring. This is why classic granite is well known for its salt and pepper look. Common accessory minerals found in granite include black mica biotite and black amphibole hornblende. #3. Almost all granite is igneous, which means its hardened from magma. It’s also plutonic, which means it’s so massive that it is buried in large slabs. The lack of fabric, or the random arrangement of grains seen throughout slabs of granite, is proof of its plutonic origins. Granite is a naturally forming material with unmatched beauty and durability, hence why it’s popularly used in kitchens across the globe. The demand for granite gives it a higher price tag than many other countertop materials. You can score high quality granite countertops for less by buying wholesale through Tops Kitchen Cabinet! Contact us today to learn more and shop our wide selection of beautiful granite.